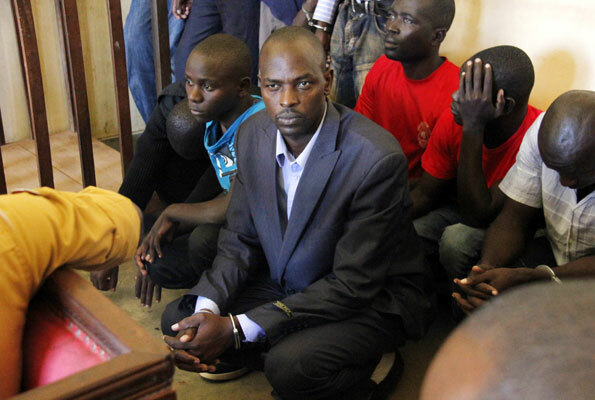 KAMPALA – Godfrey Muhirwa, a businessman of Ndeeba, Kampala has Thursday, January 10 been charged for allegedly shooting three security operatives to death. Muhirwa, a resident of Nsiiko zone Ndeeba in Rubaga division has been charged before High Court Judge Steven Mubiru and denied all the three counts of murder slapped against him by the state. It is alleged that Muhirwa on October 15, 2014, shot dead three security operatives who include Deogratius Jaaya, an operative of the Police’s Flying Squad; Mohammed Kiwana, a former Operation Wembley operative and Martia Busuulwa at Nsiike zone in Ndeeba, a Kampala suburb. Muhirwa also faces charges of unlawful possession of a firearm. According to the evidence on court records the two bodies were found lying in a premio vehicle with 19.9million shillings which is suspected to be part of 20 million shillings which was stolen from the accused [Muhirwa]. The post mortem examination carried out on the bodies of the deceased persons showed that they all died from gunshot injuries. Now the judge has fixed January 24th as a date to start hearing the matter.